Session Settings is a way to change what happens when log into Lubuntu. Here you can manage applications and services at startup. 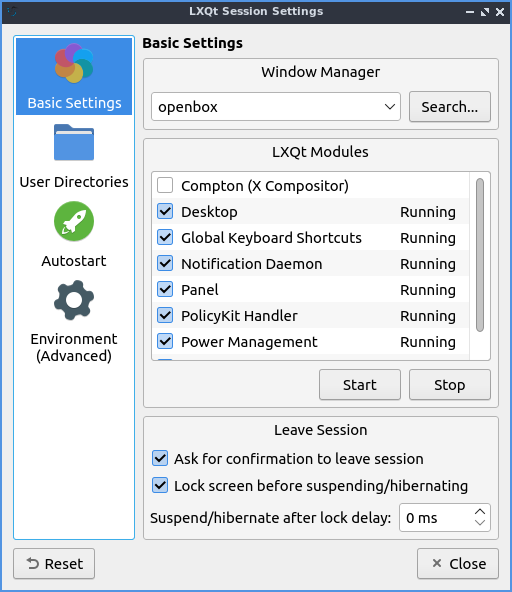 The Basic Settings tab lets you change with a window manager and LXQt modules. To change the window manager used by LXQt, on the basic settings tab use the Window Manager drop down menu labeled window manager. Choose from the drop down list or Search if the drop down list does not contain your new window manager. LXQt modules lists the different part of LXQt if you find you do not want part of LXQt active you can enable or disable them here. If you wish to start the compton X11 compositor you can do so here, we have chosen to disable it at default to lower system resources by default. To stop an LXQt Module left click on the module name press the Stop button. To start a stopped LXQt Modules press the Start button. The checkbox for Ask confirmation to leave session gives you a simple yes no dialog to make sure you really want to leave so you do not lose your work uncheck it if you do not want this and find this dialog annoying. The Lock screen before suspending or hibrenating checkbox locks your screen before suspending and hibernating and is checked by default unchecking this will leave this so the screen is not unlocked after suspending or hibernating. The Default Applications tab lets you change your default browser and terminal emulator. The drop down for Terminal Emulator lets you change the terminal emulator and the drop down for Web Browser lets you change your webbrowser. The Autostart tab has settings for what to autostart. 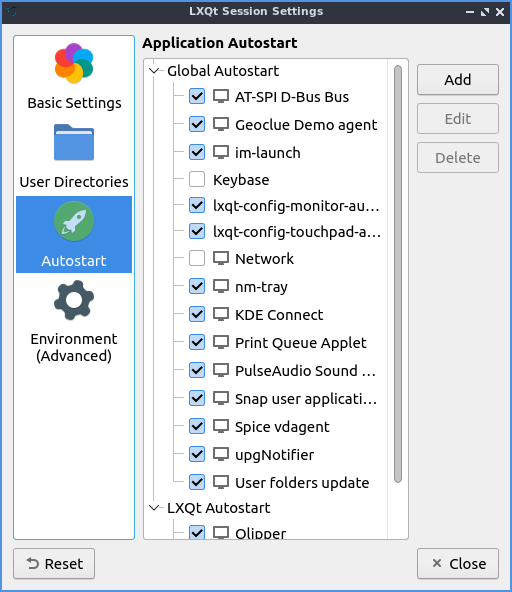 The autostart applications lets you choose which applications to autostart like managers for print queues. All of these are check-boxes to start various programs. You can start a program at startup by adding it here. Click the Add button, give the process a name e.g. “Terminal drop down” and type in the appropriate terminal command e.g. “terminal -d” where it says Command. To change a keyboard shortcut press the Edit button. To remove a setting for autostart left click on the autostart press the Delete button. The tab for Environment (Advanced) has many effects for you environment variables for your session. The Variable Name provides the name of the environment variable. To change the value of a variable double click on the value under the Value column. To add a new environment variable press the Add button. Then at the bottom a dotted line will appear and double click to enter the Variable Name and the Value for the variable. To delete an environment variable press the Delete button. Several of these variables relate to hidpi support see https://forum.lxqt.org/t/detailed-guide-to-enable-high-dpi-scaling-on-lxqt/507/5 . If you want to undo changes you have done press the Reset button. Lubuntu ships with version 0.14.1 of session settings.